Looking for a WILD day? Look no further then Cambridge, Ontario’s African Lion Safari for a WILD time! 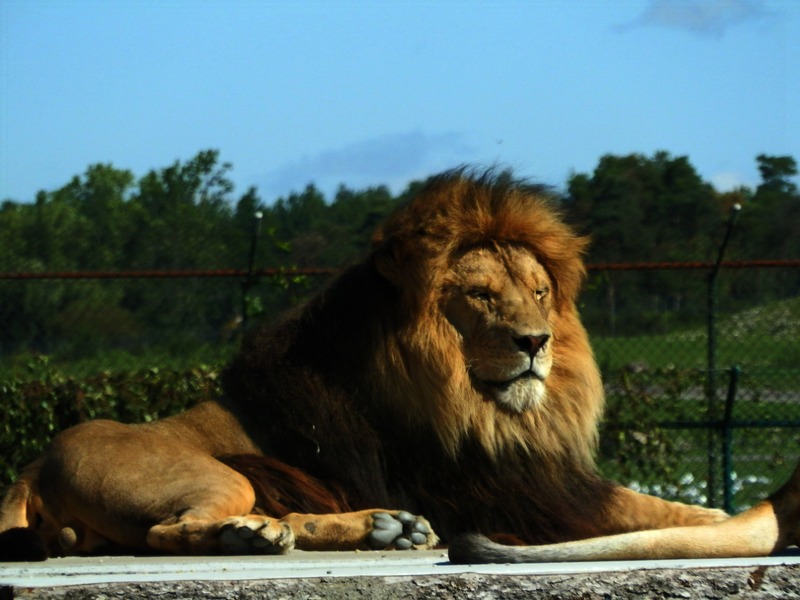 African Lion Safari opened in 1969 and is now home to over 1000 exotic birds and animals of over 100 different species. African Lion Safari offers a unique experience for visitors with the ability to drive through by car or their bus through their 7 reserves, ranging from 5 to 50 acres each, where animals roam ‘WILD’. I was thrilled to finally visit African Lion Safari and excited to go on their bus, as I know how monkeys are and like my car too much to give them access to it, and experience the closest thing I’ve had thus far to an African safari. I must admit I was fearful of the bus’s windows being cloudy, scratched or dirty – always thinking of taking photos. But I was relieved when I got on and looked out a clear, stainless and crisp window – Yah! The bus takes you slowly, with plenty of time for photos, through each of the seven reserves with the driver acting as guide – telling visitors about the park, details about individual animals as well as the animals in general. The first reserve is Nairobi Sanctuary where you’ll see elegant birds like the crowned crane and white storks and along side them are robust Watusi cattle and llamas. Next is Simba Lion Country where we met their large pride of lions, you guessed it, mostly lounging, perched on large rocks or in the shade of trees. Their youngest, still a cub but growing fast, was busy stalking his mother and pouncing on her. Too cute! Another large cat was in the next reserve, the Duma Cheetah Preserve. Here we met a trio of brothers who were all up and about, elegant and stunning as always. African Lion Safari has been very successful with breeding these amazing cats who are known to be difficult to breed in captivity, with over 40 cheetah cubs born here to date. The most entertaining reserve is Wankie Bushland Trail where you’ll encounter miniature zebu and a troop of always energetic and curious olive baboons. 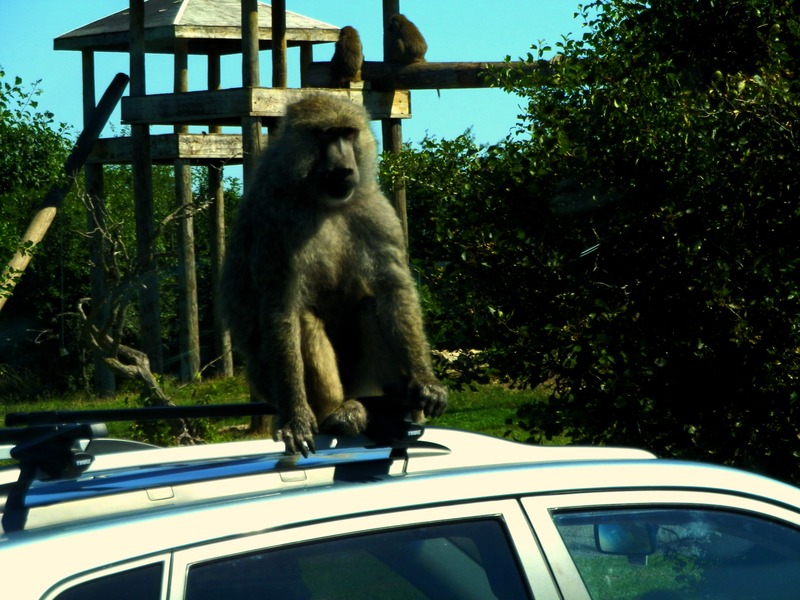 It appears as though the baboons, mostly adults, use the cars passing through as a new toy whether to pull at wipers or peel rubber stripping or to simply perch atop the car’s roof and take their own private ride around their home. While we drove passed one such baboon it was as if he was curious to peer in the bus to watch us as much as we wanted to watch him. It was too funny to watch these guys riding around on a few of the different vehicles. Though I’m a big fan of big cats, I must admit my favourite reserve was the Rocky Ridge Veldt. It’s here you truly feel the adventure of a safari with a mix of species from the curious ostrich to the highly endangered Rothschild giraffes, as well as addax, wildebeest, zebras and eland, all of which you’d find grazing the savannahs of glorious Africa. It was unreal to be surrounded by so many different species all going about their lives. My favourite in the reserve was the rhinos, these large, bulky creatures are sometimes seen as mean or bullies but when I see them all I see are impressive animals who are endangered and who can be very sweet and tender. I watched as one decided to start trotting around, almost prancing and attracted a couple more rhinos to join in the frolic. The last reserve takes you to North America where you’ll meet some impressively large and iconic animals like elk and the original Hulk, bison. I was floored to be so close to both these animals and had no idea of just how massive their bulk truly is. Nothing short of astounding. Along with the thrill of adventure on safari African Lion Safari also offers a casual boat ride on one of their ‘African Queen’ boats that take you around one of the lakes where you’ll catch glimpses of various primates on man-made islands that litter the lake. Here, also with nothing to block your view of the animals, except perhaps an excited human head popping out of it’s seat, you’ll see spider monkeys, siamangs and lemurs swinging and sun worshipping on their own island homes. For a different and local perspective there is the ‘Nature Boy Scenic Railway’. From the savannahs of Africa to right here in southern Ontario where the train takes you around a separate 16 hectare reserve that is inhabited by a few exotic animals as well as wild animals native to south Ontario. Just in the short time of our visit I saw a great blue heron, a painted turtle and a few other birds. Then there was the exotic introduction of the reindeer herd who all decided to walk straight along the train tracks towards us, it was like they were coming to greet us. The train paused as the herd broke to go around, but one went along our side and again I was so impressed by how close you get to the animals, it really takes the experience to a new level! A safari, a boat ride and train ride – what more could there be? So much more! 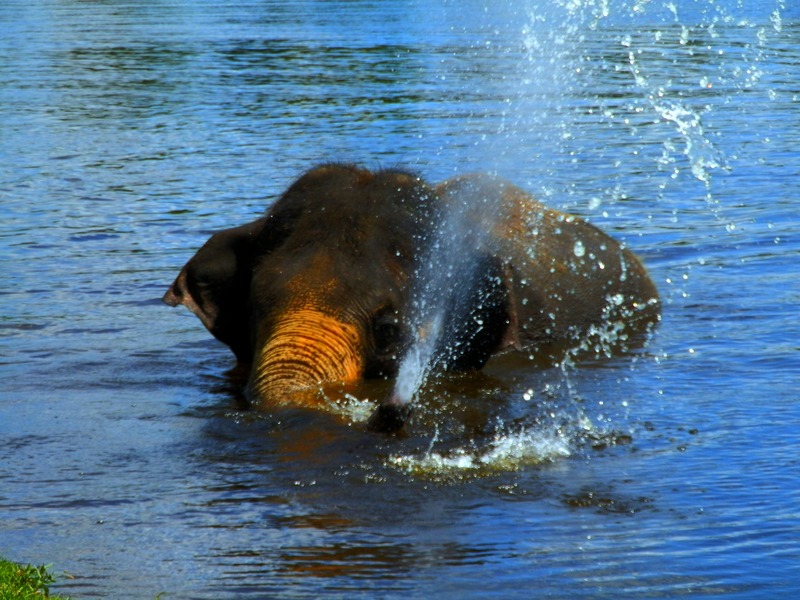 There are also a number of entertaining and informative shows starting with the Elephant Swim. The keepers bring the Asian elephants, usually four different individuals for each show. And we waited at the lake, here came four large animals (elephants being the largest animal on land) all cutely holding the one in fronts tail by their truck, from oldest at 35 to youngest at 2 1/2 years-old. Even though many have heard that yes, these massive mammals not only can swim but do so well and with ease, it is still a sight to actually see it. I was in awe! They started at one side of the lake and all made their way to the side where all of us observers were. One of the older ones was a bit off from the rest and right in front of me, it was so comical, I swear it was putting on a show and hamming it up by repeatedly creating a water fountain with it’s trunk. WILD! One of my favourite shows was the ‘Birds of Paradise’ show where various birds showcase their incredible intelligence like a crow cleaning up tin cans to put in a blue recycle bin to a macaw deciphering colours, as well as showing off their natural abilities like the comical red-legged seriema, a long legged bird from South America, that can jump straight up and that kills lizards by picking them up and throwing them hard to the ground, again and again. It was a fantastic show that was interactive for selected volunteers (kids) in the audience, funny and entertaining with a wide assortment of birds like macaws, emu, young flamingos, even an Indian flying fox (a bat – only flying mammal), and closing the show out was a talking and singing parrot. WILD! Another great show was the ‘Birds of Prey’ show where as these intriguing birds soar over the audience you’ll learn about their unique flying styles as well as what their role as predators in nature really means. Working with over 150 birds that represent 40 species not every show is the same. For the show we watched there was the pretty white stork, the sadly ugly marabou stork, a bald and golden eagle, a couple of owls and closing out the show was the majestic peregrine falcon (the fastest animal). From birds to elephants, for the ‘Elephant Round-Up’ show where keepers help to display the elephant’s impressive strength, agility and intelligence. One even painted a t-shirt in the show, holding the paint brush in it’s trunk and picking one then another colour to paint with. These t-shirts are even available for purchase. With a fun filled and informative day rounding up I opted to go for an elephant ride. Though I was torn if I should, I chose to just do it. My first elephant ride was on a sweet elephant named Lily. I was blown away by how graceful it seemed for this large animal to maneuver. I was happy to have chosen to do so if but for nothing else then I have an even greater appreciation for these iconic and endangered animals. African Lion Safari is home to the largest Asian elephant herd in any zoological facility in North America and has one of the most successful breeding program for them. On top of that it is also a founding member of the ‘International Elephant Foundation’, a non-profit organization that provides funds for conservation programs world wide. I highly recommend the African Lion Safari for a unique, informative and entertaining fun-filled day out at a zoo. I also recommend getting there early! Not only to beat the crowds but for the fact that there is so much to see and do. The African Lion Safari dose not just provide an entertaining day out for it’s visitors but is very much dedicated to its animals as well as conservation in the field. 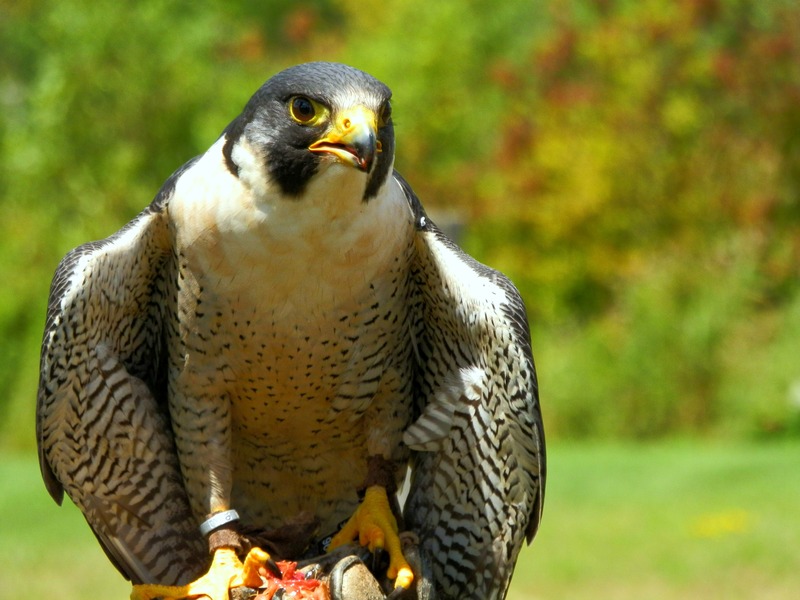 With notable births like Ontario’s first birth of a giraffe in 1977 and Canada’s first peregrine falcons to hatch in 1980, the park provides captive bred species to reintroduction programs for release into the wild. Some species that have been bred at African Lion Safari and released into the wild are Trumpeter swans, barn owls, burrowing owls, Ferruginous hawks as well as a bald eagle. On top of all this greatness the African Lion Safari has various awards like the “Col. G.D. Dailley Innovation in Breeding Programs Award” for their barn owl breeding program, the “Baines Trophy” (which is the highest Canadian Association of Zoos & Aquariums CAZA) for their exemplary work with it’s cheetahs, and the “Outstanding Achievement Award” for their work with giraffe management and reproductive research. So whether you’re looking to entertain and educate the kids with a day out or are looking for a close encounter then African Lion Safari is the place to go. One thing I know for sure is visiting African Lion Safari will be WILD! Oh it’s a must! It is definitely worth it!